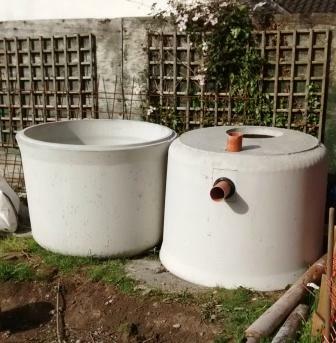 I now need to look into rainwater harvesting as the location of a tank needs to be planned so that the inspection covers can be kept as discreet as possible in the garden design. I will put the inspection covers in the footpath area. I am only installing the rainwater harvesting initially to feed the toilets in the house, water plants and wash the car with a gravity fed tank located in the house (this looks like the simplest method to maintain and install). My reason for only dealing with the toilets is the idea of using fresh water to flush toilets is a difficult thing to accept from an ecological point of view and toilets are a significant use of water. 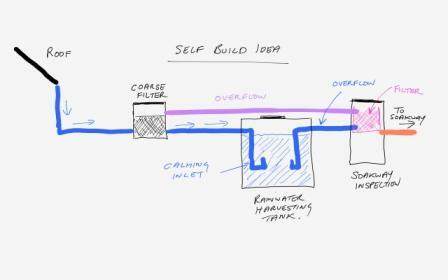 Whole house rainwater systems look complicated from a health, engineering and chemical reaction point of view. Issues I understand that need to be dealt with for whole house systems are such things as if the PH level of the water falls below 7 it attacks copper pipes, the stagnation of stored water/pollen attracting pests, chemicals such as lead collected from roofs etc. There appears to be a need to have a few inspection covers and have access to these. The first inspection cover will consist of a coarse inline filter for collecting leaves and other debris with an overflow outlet, the rainwater harvesting tank inspection cover (for servicing the pump or cleaning out the tank)-some have the inline filter built into the tank. Our new build installation also needs a soak-way and inspection cover as part of the planning application to ensure that the soak-way can be cleaned out. Another important point for any tank is the need to have a calming input (when water comes into the tank the objective is to ensure it does not mix the sediment settled in the bottom of the tank with the end result of supplying dirty looking water in the house. ) I will look into this later on once I have researched pumps in more detail. In relation to pumps/controls that are available I feel they are too expensive to buy, run and are complicated (from €250 to €600 and use 500 watts to 1000 watts of power-a small electric fire ) . In the next blog I hope to find a solution that will cost no more than €90 and is simple to maintain and reliable. I am evaluating this design I put together and I am thinking of putting a straight outlet into the soakway so that any pollen/debris gets washed directly into the soakway inspection chamber . My reasoning if correct is that this will reduce the smaller debris from stagnating and smelling when the tank overflows. 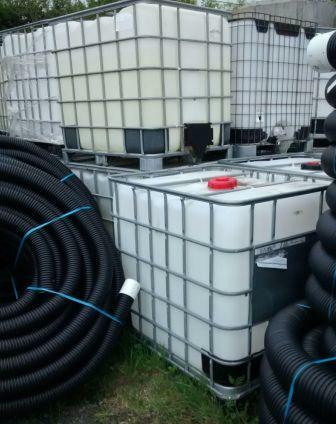 I came across these storage tanks at around €50 (value for money) . I think they have a capacity of around 1000 litres . Lawler Pipe Sales in Johnstown, Naas at 0862561629 can supply them. One would need to paint them black or ensure that light does not cause algae to grow.